How can hardware make the computer-based studio more productive? Each trade show invariably brings new offerings that seek to answer that problem as vendors hawk their wares. At Frankfurt’s Musikmesse, steps from one another, three well-known names each each offered their own take. It comes at a time when the industry is re-imagining the role of our machines. It used to be that big, metal boxes said “pro” – and the studio was no exception. (Cue flashbacks trying to set up Digidesign expansion racks in the late 90s. Okay, now putting that out of my mind.) That’s still true in gaming and 3D rendering, but in audio, there’s no reason you can’t use a svelte laptop, to say nothing of the tablets (okay, iPads) finding their way into studio rigs. From Universal Audio is perhaps the boldest sign that those days are behind us, as massive amounts of processing power and I/O are piped through a single Thunderbolt adapter (alongside FireWire). In fact, there’s no reason you couldn’t pair this rack with a MacBook Air. But Softube and SPL also had their own offerings for the (now-mobile) studio, and they’re both just fine over USB. Softube is a hardware/software combination (Kore meets the channel strip? 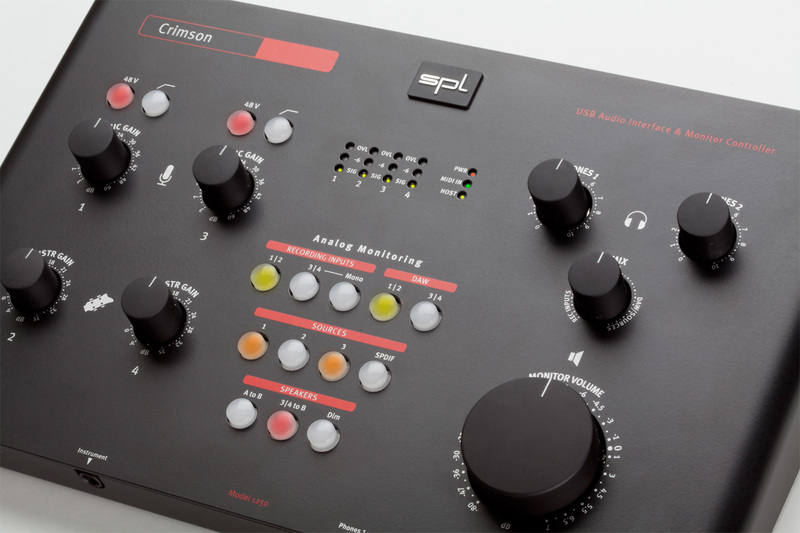 ), and SPL is doing an audio interface that’s also a hardware controller. I’m mentioning them together not necessarily because of what they have in common so much as how they differ. Do you want your software running on your host (Softube) or dedicated DSP chips (UA)? 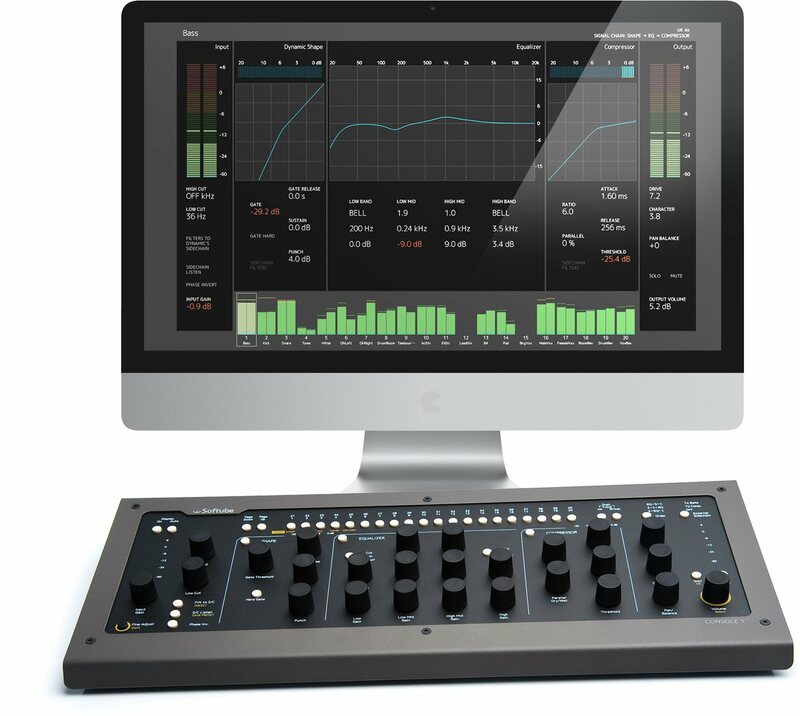 Do you want a controller for your DAW (SPL) or for dedicated, consistent channel strips (Softube)? Do you want an audio interface with DSP (UA) or an audio interface with controller (SPL) or a controller with no audio interface (Softube)? Do you want to provide your own plug-ins (SPL) or get some modeled stuff in the package (Softube, UA)? Apollo remains a showpiece for Thunderbolt on the Mac – and an indication of why current iMac, Mac mini, and MacBook make Mac Pro look like a dinosaur. Now nicely getting the name of a NASA moon mission, the latest Apollo from Universal Audio is a serious higher-end variant of the already-nice Apollo we saw introduced last year. The combination of Apollo’s hardware with UA’s software is something special, I’ve found, as I’ve used this in productions with my friend Benjamin Weiss (nerk) of De:bug. We in fact have our laptop poised atop the rack, as in the image. It’s the combination of sub-2ms monitoring with the range of UA effects that’s so appealing. You have a range of tools from modeled classics to apply as colors to your sound, but also the ability to monitor live – as nice when working with synths as when recording instruments. And while there’s something that seems a little unfair about having all these classics in software form, you can combine them in ways that were impossible, impractical, or hard-to-afford using the originals. The 16, as the name implies, gives you 16×16 analog I/O of the same fidelity as the previous model, plus four stereo cue outputs for monitoring, and onboard UAD-2 QUAD processing for lots of horsepower. I am a bit surprised, honestly, to see that Thunderbolt remains an optional add-on. But the audio world is fairly conservative about hardware upgrades, so it makes some sense, I suppose – and the Apollo 16 still runs over FireWire, though Thunderbolt is what you want for the most bandwidth and latency going forward. US$2999 (street) buys you the Apollo 16 second quarter of this year. The Thunderbolt Option Card is out now for this and the previous Apollo, at US$499, and includes two ports so you can connect other gear or chain Apollos together for 32 channels. It’s not cheap stuff, but it is powerful. SPL is the most conventional of the products here: it’s a combination of a USB audio interface and a monitor controller. What’s nice about it is the roomy control layout and fine build quality of the controls and audio – the SPL-ness of it, let’s say. It’s impossible to judge that based on a trade show, but the specs look promising. Due in July for 549 € / US$725 at dealers. Each control is mapped to individual tools. We’ve seen that in DAW-specific controllers and production tools, but this is just for one mixing plug-in – the DAW choice is then up to you. Seen with the computer heads-up display, Softube has made both original software (running on your CPU) and hardware (for control, just of that software) to produce a unique mixing workflow. Softube’s announcement, of the three, is perhaps the most intriguing – but it’s also the one with the most to prove. It’s easier to describe what the Console 1 isn’. It isn’t an audio interface. It isn’t a DSP box. Even though it comes with a modeled UK 4k analog mixer, and even though Softube just began offering (rather amazing-sounding) Amp Room models for Universal Audio’s UAD platform (I’ve been using nerk’s on Apollo, in fact), everything runs on your computer’s native processor. So, it’s just a mixing controller for your DAW? Well… yes and no. 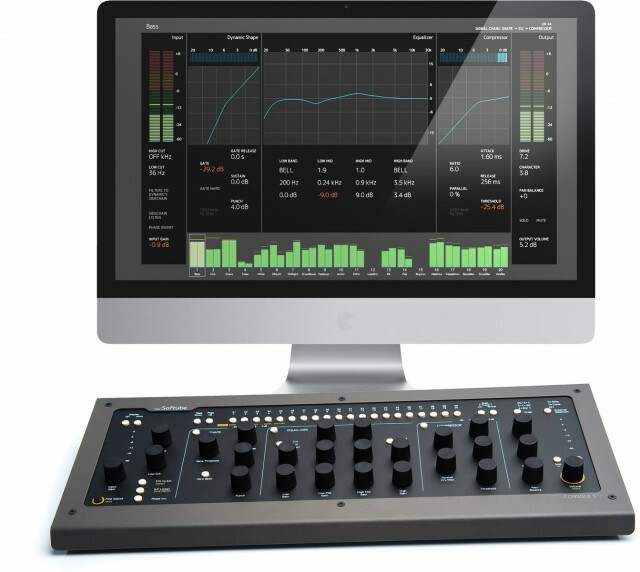 It is a controller exclusively for Softube’s own mixing software. As Native Instruments’ Maschine attempted to do for drum machines, this is hardware designed to pair with software, giving you tactile control of software designed to work only with its controls. 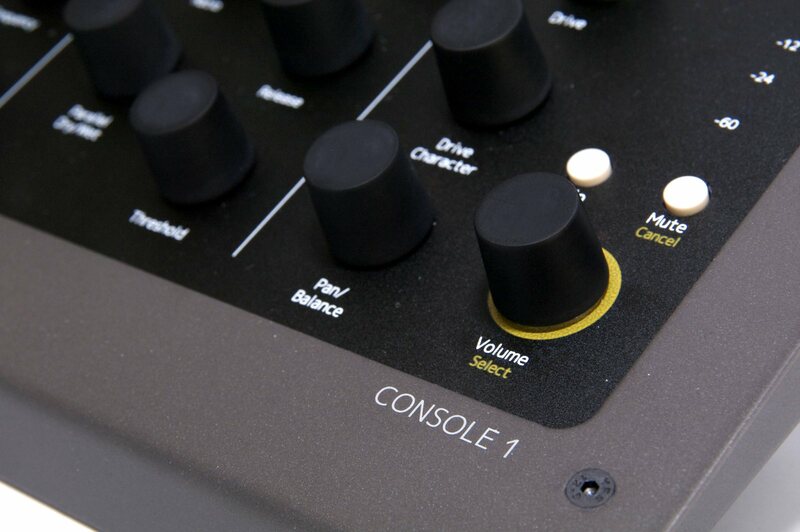 Then, Console 1’s hardware controls the Softube software designed for it, with a one-to-one correspondence of knobs and labels to parameters. This means that the whole package lives and dies on the software. What Softube says you’re getting is a new model called the UK 4k, based on “a classic large-frame British console from the late 1970s.” Each channel includes the expected EQ, compressor, modeled Drive (analog overdrive), and, departing from the UK original, a new expander/gate – transient shaper Softube is calling the Dynamic Shaper. There’s also a nice visual display on the computer. But onboard LED meters and indicators around the knobs are enough, say Softube, to allow you to mix without ever touching or looking at a computer, presumably the main draw. 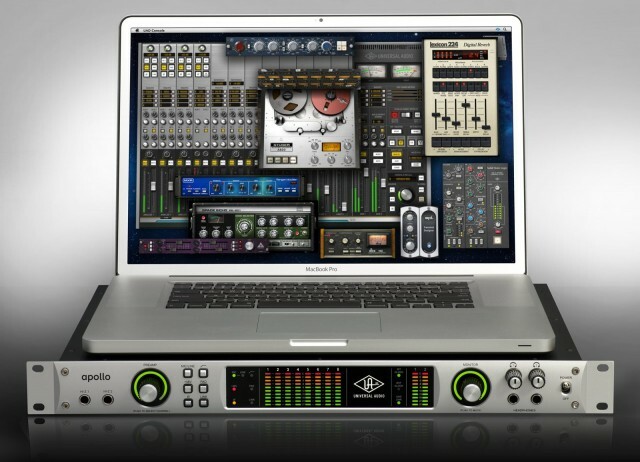 Like the UAD, Console 1 will eventually be its own platform, with plug-ins that run inside the Console 1. There, I have to be a bit skeptical: with so many “platforms” out there, I wonder if people are ready for another. Unlike the UAD, you aren’t buying specific plug-ins to take advantage of DSP power on the add-on hardware; you’re just doing it for these controls. And initially, you’ll have to buy it just for the initial channel strip. But I guess we’ll see what the workflow is like, and whether it attracts an audience, when it ships this summer. Softube’s software is compatible with VST, VST3, AU, RTAS, and AAX Native; initially Mac-only with Windows “to follow.” Because it’s a plug-in, it’ll support plug-in automation, so those knob twists do get recorded. It’s certainly an intriguing idea: build a computer-based mixing system with analog sound, and focus on hardware controls. This summer, we’ll see if it delivers. Do any of these appeal to you? Any you’d want to see reviewed? Or are you passing on all three, in favor of other tools? Let us know in comments, and don’t hold ba– oh, yeah, this is the Internet. Probably don’t have to say that.